Cultivate Hope Urban Farm, 437 G Avenue, NW, Cedar Rapids — Tuesdays, 4:00 p.m. Vegetables grown at Matthew 25’s urban farm in Cedar Rapids. — photo courtesy of Matthew 25. On Tuesday, Cultivate Hope Urban Farm in Cedar Rapids will open its own farmers market. Cultivate Hope, the state’s first farm founded inside a city, and its new Cultivate Hope Market are projects of Matthew 25. The Cedar Rapids nonprofit, which takes its name from a biblical passage in which Christ stressed the importance of helping those in need (“Assuredly, I say to you, inasmuch as you did it to one of the least of these My brethren, you did it to Me.”), was started in 2006 to “help strengthen and elevate neighborhoods on the west side of Cedar Rapids,” according to its website. Matthew 25’s neighborhood improvement efforts focus on three things: food, housing and education. The focus on food led Matthew 25 to create Cultivate Hope Urban Farm near downtown Cedar Rapids in 2012. The farm is located on two acres in the northwest part of the city. Its location had previously been the site of several houses, but they were heavily damaged in the flood of 2008 and eventually torn down. “It was built on land that people couldn’t rebuild on after the flood,” Bodensteiner explained. The farm doesn’t use herbicide or pesticide. And while it has a full-time manager, Bridget Fonseca, volunteers provide much of the labor, Bodensteiner said. During the summer, there are also student workers. The farm also hosts tour groups, and has a 1900s farmhouse with two guest rooms that it rents out through Airbnb. But its main focus remains on getting fresh produce into the hands of people who don’t often go to a farmers market. To help achieve this, Cultivate Hope Market will accept SNAP benefits and is in the process of becoming certified to accept WIC. Produce will also be sold at half-price to people meeting certain income qualifications through Cultivate Hope’s Farm Fresh Friends program. 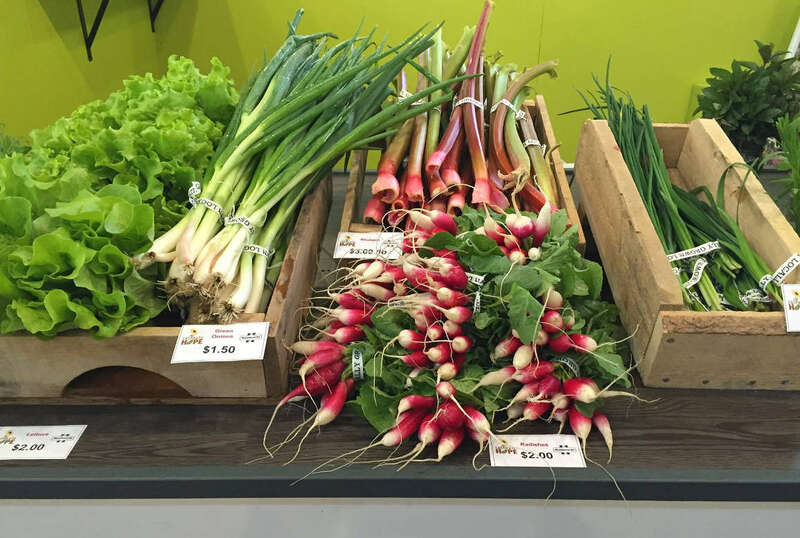 For its first market, Cultivate Hope will be selling rhubarb, green onions, radishes, lettuce and fresh herbs. Bodensteiner said that as the season progresses the market will have all the standard items familiar from other farmers markets, from broccoli to melons and at least two dozen different types of tomatoes. Plans also call for a food truck at every market and activities for kids. During the first and third week each month throughout the summer, instructors from the Midwest Athletic Club will be conducting yoga sessions at the market. Cultivate Hope Market in Cedar Rapids will be open each Tuesday through October, from 4 to 6:30 p.m., at 437 G Avenue, NW. All proceeds from the market will go to support Matthew 25. I don’t think its accurate to call this Iowa’s first urban farm. Iowa City has multiple folks growing inside city limits for years. Echollective CSA, Millet Seed CSA, Friendly Farms, Calico Farms, etc. Still a great project, though, and much respect to the folks in CR!